Russia’s capital has extensive burial grounds, most of them dating back to the pre-Revolutionary times. 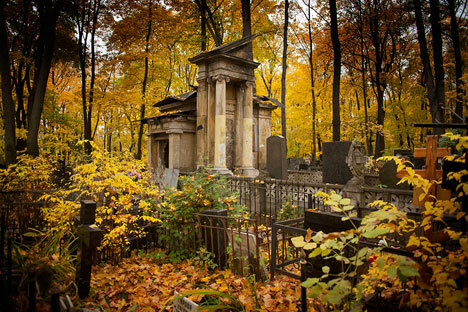 RBTH offers a short overview of the most mysterious and peculiar stories of Moscow graveyards. Moscow’s more than 10 million residents are living closer to the deceased than they might realize. Underneath the sprawl of the Russian capital’s urban development lie hundreds of buried cemeteries and graves, built over and nearly forgotten as Moscow emerges as one of the largest cities in Europe. During the demolition of a tram line near Simonov monastery south of city center, workers uncovered hundreds of headstones with names and epitaphs carved into the underbelly of the pavement pieces. As it turns out, when the line was being constructed in the 1930s, the territory of nearby monastery’s graveyard had been turned into a construction site for the ZIL motor plant, so the grubbed-up, solid headstones were used for street paving. Same thing is true for some of Moscow’s peripheral subway stations, where trimmed former headstones were used as marble coating of walls and columns. For Russians, the local graveyard has always been an important location in every village and town. Traditionally, every man wanted to be buried near his home church. Moscow, which had more than 400 churches, was laden with graveyards: In the 19th century, there were more than 300 graveyards, most of which were demolished in first decades of the Soviet Union. Today, Moscow has only 71 graveyards and cemeteries, but a great number of parks and buildings are situated on former burial grounds, a fact which many city residents do not realize. Graveyards inside the Kremlin walls were one of the first to appear in Moscow. After the 14th century, princes and then czars were buried in vaults in Arkhangelsky cathedral. But the Soviets in 1917 built an “alternative” burial ground outside the Kremln’s brick walls, where they laid to rest their Bolsheviks comrades who had fallen during the October revolution in Moscow. In 1924, the Lenin Mausoleum became the center of the cemetery. Stalin was kept in the mausoleum after his death in 1953, but moved in 1961 to a grave near the wall. Debates persist in Russian society today on the subject of whether the cemetery should be removed from the Red Square. During the liquidation of the graveyards inside the city, ashes of many writers, military commanders and revolutionaries were transferred to the new cemetery near the Novodevichy monastery. This fate befell the remains of the great writer Nikolay Gogol. Deceased in 1852, he was buried in Danilovsky monastery, but in 1931, while the graveyard was being liquidated, the government ordered to reinter Gogol on Novodevichy graveyard. Some contemporary writers, who were present at the exhumation site, were awed when the coffin was opened – the late great writer’s head was missing. This didn’t, however, perplex the writers: It is reported that a now-forgotten writer, Lidin, even dared to take a cut from Gogol’s frock, which was later was used for binding of a lifetime edition of Gogol’s “Dead Souls” that Lidin possessed. Gogol’s ashes were reinterred nonetheless, but where did the head go? Rumor has it that in 1909, when Gogol’s grave was renovated, Alexey Bakhrushin, a famous Moscow merchant and eccentric, bribed monks of Danilovsky monastery and retrieved the writer’s head to store it in his museum. Since then, the trace of Gogol’s skull has been completely lost. Meanwhile, the mentioned copy of “Dead Souls” is reportedly in possession of Lidin’s daughter. The new Novodevichy cemetery became the burial ground for most of the Soviet Union’s elite - in Soviet times, entrance was allowed only to relatives of the deceased, who had special passes. Today it’s free of charge. Still, the price for burial in the cemetery is very high. It is also expensive to be buried in the famous Vagankovskoe graveyard, the last home for many actors, painters, and bohemians. In fact, overall, most of the old graveyards inside the city borders come with expensive fees for burial plots. Among the most expensive is the Vvedenskoe graveyard in Lefortovo, the former territory of the German Quarter of Moscow, which was organized in the 17th century for foreign residents of the city. Today, it is possibly the quietest and most beautiful graveyard in Moscow and contains some spectacular architecture. Among the prominent monuments is the vault of G. Lion, with a mosaic reproduction of Arnold Bocklin’s “Isle of The Dead,” and the Erlanger family vault, designed by Russian architect F. Schechtel, the master of art nouveau. The walls of the vault contain scribbled messages to God from locals, such as “Lord, help me to get a job. Vladimir,” “Lord, give me strength to get B in descriptive geometry,” and so on. The inscriptions are regularly washed off to appear again. But the messages are not the only strange Russian graveyard tradition. Russian people frequently have picnics on their ancestor’s graves. In the Czarist times, particularly on big holidays, Muscovites went to the graveyard with baskets of food and samovars to make memorial feasts. These often turned into drinking sprees. In Soviet times, the tradition received an unexpected boost. When drinking in the street was banned, many people began using graveyards just to drink. If stopped by the police, the drinkers had a ready excuse: “We are commemorating our late friend.” The police, aware of the tradition, would let the winos be. The tradition is the main reason Russian graves today are equipped with benches. On a fair day, isolate a few hours and take a walk along the curved alleys of Moscow’s graveyards, among the diverse vaults and headstones bearing names of those people whose lives were once also a part of this city’s history. You won’t be bothered by crowds of sightseers – for them, Moscow graveyards are still an uncharted territory.